♥Rescue 9-1-1 Darlings The Beatles said it best with the lyrics “Help! I need somebody…”, but at this particular moment it is not “somebody” who will cure my ailments; rather it is something. Help Remedies, to be more specific. While I literally carry everything but the kitchen sink in my handbag, magically I’m always lacking the one item I need to cure what currently ails me. I have sleeping pills when I need aspirin; band-aids when I need allergy medicine; or ibuprofen when I need hydrocolloid. I think my unprepared-ness stems from the fact that I simply can’t be bothered to lug around a drugstore wherever I go; yet I am convinced that Help Remedies will set me on the right track in the chicest of ways. Their line of antidotes forgo the typical tacky pill bottles sitting in a jumbled mess on shop shelves and come in cute color-coded biodegradable containers – each one a cure-all for your current sickness. Battling a blister from your pretty yet painful pumps? Help I Have a Blister can patch it up. Combating a killer headache after that sample sale? Help I Have a Headache will alleviate the pain. I imagine I’ll need to pop all six packages into my purse – you never know when they’ll come in handy! ♥Queen of Hearts I wouldn’t recommend this sort of behavior for just anyone, darlings, as it leads to ultimate heartbreak in the end – at least it has in my world; but I’ve always been one to wear my heart on my sleeve. To lay it all on the line, and remain unmasked in any and all situations. But I have had – no pun intended – a change of heart. No longer will my heart be worn upon my sleeve; but rather, atop my head in the form of the heavenly hair accessories crafted by mother daughter design duo Old Soul, New Heart. Together, Tamara and Shea spend their off-time seeking out vintage trinkets at flea markets and estate sales, than work their crafty magic to transform them into new pieces with glamorous old souls. And as if the beauty of these creations isn’t enough to pique your interest, the adorable titles for each knickknack most certainly will. Currently my heart belongs to Lookin’ for a Beau, Meet Me on Park Ave., Flirt, Only Slightly Revealing, She Gossips, But Quietly, and Cookies for Breakfast. Which Old soul, New Heart offering will morph you into the Queen of Hearts? ♥Sealed with a Kiss Since there are currently no interesting, cute boys around whom I’d like to shower with kisses, I have decided that the best course of action is not to live life without a little peck here and there; but rather to obtain my smooches elsewhere – and no place seems as satisfying than via a tiny trinket that I can clasp around my throat. A glittering bauble that won’t talk back, question me about my whereabouts, or deem it appropriate to skip out on movie night to hang out with his “boys.” Darlings I know that the pieces in question are unable to provide the same tender, love, and care as a cute boy is able to; but at least their petite pouts will fill the void until I find someone new to swoon over. I imagine the Yellow Gold Kiss Kiss Petite Necklace by Jules Smith has the power to reel cute boys in by the dozen due to its sassy smirk which drapes decadently over your chest; a place where it will look utterly bewitching lying over a plain white tee. Sears’ Pink Sapphire Lip Necklace, on the other hand, is a bit of frippery that I am simply incapable of keeping hush hush about courtesy of the sapphire-embellished pink lips which seemingly wink at the world with every single sashay, strut, or step you take. Unleashing the smoldering sophisticate within is bound to be a piece of cake with Lulu Guinness’ Lips & Lipstick Pendant Necklace in White Bronze cinched around my throat. And really…what better way to start the day than with a wee love letter coiled around my collar in the form of Lulu Guinness’ Cream with Love Envelope Charm Necklace. Are you ready to sprinkle your accessory collection with a few kisses, kittens? Thanks to Tumblr and Old Soul, New Heart for the pictures. I love the envelope necklace, it is so darling. and those headbands are adorable! Im smitten with this post! LOVE it! Really enjoyed reading this post dear ! Hope ure off to a great weekend ! Oh MY Goodness! I disappear for 2 Weeks darling and this is what Happens?!! Fabulous Fabulous Fabulous post dearest. Those remedies are exactly what I need right now what with running myself so thin am constantly ill with something or the other. And to cheer myself up those accessories are just perfect. I might be in love wit those headbands now, it has been so long since I bought any accessories. I love the first paragraph, you are soo funny. I do that all the time, I would carry Midol and then offer it to a guy with a headache, claiming it would help. 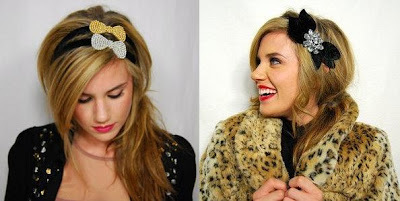 I am in love with those headbands! especially the first one with the two bows on it! so cute! Adorable post, the first pic is too cute! That silver bow headband is really nice. I was definitely smitten by the wonderful scent of Burberry Brit!! Who knew it smelled so nice? I absolutely ADORE that first photo. :) And I love your new blog layout. It's adorable. I'm sorry I have been behind on commenting lately. I don't have a good excuse other than I've been majorly depressed and just got my laptop fixed. Sigh. I just checked out 'Old Soul, New Heart'. Everything is so cute and wearable. Thanks for sharing! There are no cute boys for me either, so I''m also loving the necklaces. The one with the lipstick and lips is my favourite. Wow you've got a great blog. This is adorable -- your writing style makes me happy :) And I love your necklace picks, especially the Lulu Guinness ones! 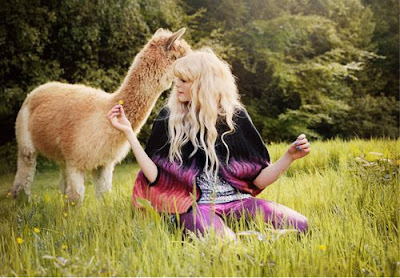 I love the picture with the alpacha! It's super adorable. adorable post! as usual... you never fail to make me smile! those bows look so much fun. That must be so amazing to go to these places to find something to make new again. I like that idea. Thanks for the links about those wonderful things that spring up. Yes, my new messanger bag won't stay new long with so much stuff I need to carry. I must carry the lippy. Only, I never have it out quick enough when I need it and I'll stumble on to something else..like a chocolate marshmellow heart that I forgot was in my bag. I know, I need order, but its happening tonight. I just love Meet Me on Park Avenue! It has the right amount of sparkle and I could see it being something I could use to embellish my boring short haircut! You Rock. You just do. Thanks for leaving a better comment each day. You are a little ray of sunshine. And high waisted skirts. I just got myself one a few days ago and I am truly O.B.S.E.S.S.E.D. So feeling those headbands! Have not tried this look yet! Want to! I love how she wore two headbands together. I will have to do that now.